16 new for years was blooming good for late July in my garden as we just creep past peak moth season, it is a sad time as numbers will probably fall away now but only slowly. 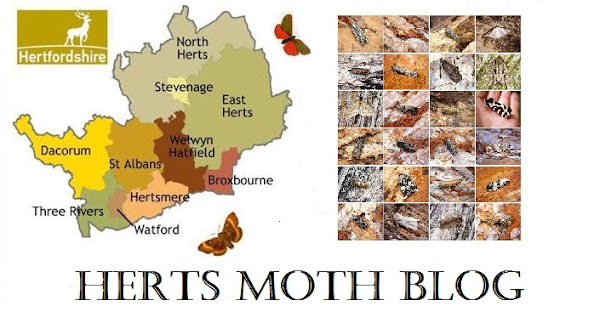 If only we got a settled month of weather for Summer then we would probably see more moths. Notable species for my garden included Pebble Hook-tip (went missing for 3 years), Shaded Broad-bar (not a common moth here) and two garden first micro moths, Eucosma conterminana and Achroia grisella. Other bits of interest was a dark Dart moth of somekind, it isn't Turnip Moth as the hindwings are dark grey, which leaves either Heart & Club and Garden Dart. It would be great if it is the latter as that would be a garden first. EDIT: Confirmed as Heart & Club by Graeme Smith, thanks Graeme. Another pretty moth and quite common this year in the garden, a stunning form of July Highflyer. Weather-wise now we stick with the changeable conditions, if it's sunny then it is warm, but with plenty of cloud and rain the temperatures look set to struggle in the low 20's.